APPROACH: This playlist is designed to support classroom teachers as they equitably incorporate more science talk in their classrooms—as students engage in discourse to make sense of scientific phenomena and engage with science and engineering practices. Read and discuss the following tools in small groups. Allow additional time to process and explore the second two briefs, as they link off to other useful tools and activities. Taken together, reading all these briefs might lead to a larger discussion and strategy-sharing session around how to support student talk in the science classroom. Read and discuss these two tools. Reflection questions on each tool can be used to guide your conversation. Scientists and other professionals routinely talk about their work — not just to share their results, but to make sense of their work at all stages, to gather feedback, and to refine their ideas and arguments. This brief discusses how teachers can support their students in these same types of productive sensemaking talk. When students are engaged in science discourse, some may feel more able or comfortable participating than others. This brief explores strategies teachers can use to structure student sensemaking to be more equitable and allow for multiple perspectives to surface and be attended to. Read and discuss the following two tools, possibly using the reflection questions on each tool. Take a bit more time to explore these tools; each brief links off to many additional resources to be used in the classroom. Teachers can use specific instructional approaches—or ‘talk activities’—to support students’ use of discourse and talk as they learn. 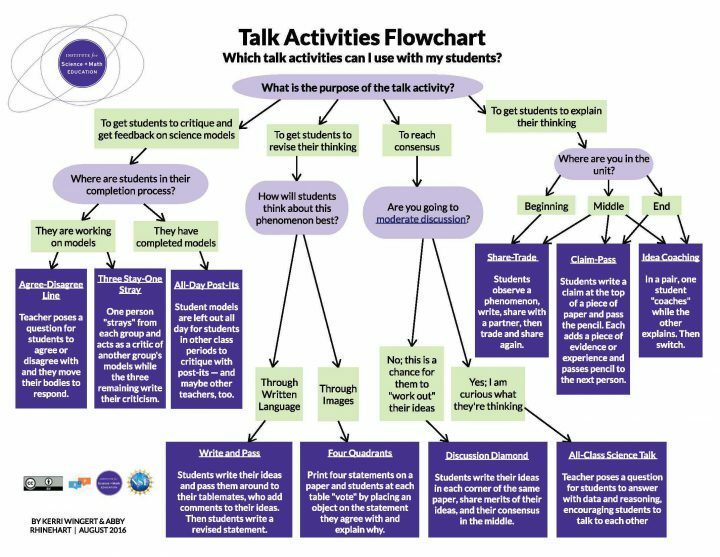 This brief introduces a Talk Activities Flowchart, which highlights ten different talk activities and explains when, how, and why to use each one to support student investigations. Classroom talk can help students make sense of scientific phenomena and clarify their own thinking. It also can help teachers learn what their students are thinking. This tool offers resources to support both, in the form of talk cards, partner conversational supports, pre- and post-talk graphic organizers, and a formative assessment monitoring chart. Close with a full-group discussion on ideas and action plans you are taking away from this session. As a follow-on learning experience, you should consider exploring another playlist focused on supporting science learning through the argumentation practice.